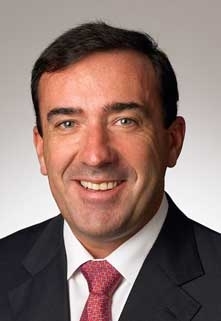 Batey, 49, will report to Mark Reuss, GM's president of North America. DETROIT -- General Motors said today that it is shaking up its U.S. executive ranks, including moving Chevrolet sales boss Alan Batey into a newly created position as GM’s vice president of sales and service. The move makes Batey, a 49-year-old Brit who has been Chevy’s vice president of sales and service since spring of 2010, GM’s top U.S. sales executive. He’ll report to Mark Reuss, GM’s president of North America. The sales chiefs of each of GM’s four brands now will report to Batey, rather than to Reuss. Don Johnson, 55, who had been U.S. vice president of sales operations, will take Batey’s spot as head of Chevy sales and service. Johnson’s position will be filled by Kurt McNeil, vice president of sales and service for Cadillac. McNeil also will report to Batey. GM announced the moves today in a statement. Chase Hawkins, 43, regional director of sales and service for Cadillac in the Northeast, has been promoted into McNeil’s spot to oversee Cadillac sales and service nationally. GM also said that it is promoting Ed Peper, 50, to vice president of U.S. fleet and commercial sales, a position that had been vacant. In January, Peper moved to his job as general manager of GM’s fleet business, after being general sales manager at Cadillac. The changes take effect June 1, GM said in a statement. The moves come as GM’s U.S. market share has come under pressure. Its U.S. sales this year are flat compared with the same period last year while its market share has dropped to 17.7 percent in April, from 19.6 percent for all of 2011, according to the Automotive News Data Center. "GM is playing offense with an aggressive rollout of new cars, trucks and crossovers," Reuss said in the statement. "Strengthening our U.S. sales team will help take full advantage of these growth opportunities and continue delivering solid improvements in customer satisfaction, dealer profitability and resale value." The insertion of Batey’s new position between Reuss and the four brand sales chiefs reflects the growing workload at each division as GM heads into a busy 2012, GM spokesman Jim Cain said. GM is preparing its heaviest launch schedule of new and redesigned cars and trucks in many years, including the next generations of its pickups and SUVs. "It’s all about the volume of launch activity that we have going across all of the brands," Cain said. "At the same time our dealers are undergoing an aggressive campaign of investment in their facilities. And we’re in a market that we expect to keep growing." GM has overhauled its U.S. executive ranks several times since the automaker exited bankruptcy in July 2009. Significant shake-ups have come under both former CEO Ed Whitacre and current CEO Dan Akerson, who took the top job in September 2010. The last big move in the sales division came in March 2010, when Whitacre expanded Reuss’ role as president of North America to include sales responsibility. Reuss decided to split the traditional job of a single brand manager into two positions: one for sales and service, and the other for marketing. The U.S. sales chiefs for GM’s four brands had remained unchanged since that shake-up two years ago: Batey at Chevrolet, McNeil at Cadillac and Brian Sweeney as vice president of U.S. sales and service. Sweeney will remain in that role. GM’s marketing ranks also have undergone considerable turnover since the arrival of Joel Ewanick in May 2010. In August 2010, Ewanick hired Chris Perry to head U.S. marketing for Chevrolet, later elevating him to U.S. marketing chief over all four brands, before returning Perry to global vice president of Chevy marketing. Akerson has made several other significant changes in his 20 months as CEO. They include the installation of Mary Barra as GM’s senior vice president of product development in January 2011 and the November appointment of Karl-Friedrich Stracke to lead GM’s European business. Editor's note: An earlier version of this story misidentified how many of the last four months GM's U.S. sales have declined. The story is now corrected.